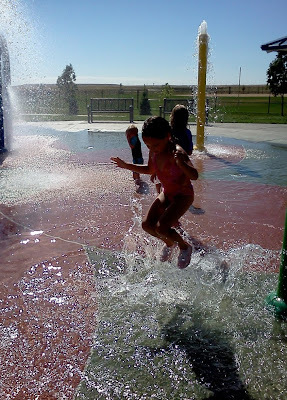 Out of the blue this week, H asked me, "When are we going to that one spray park again?" We have enjoyed several in our area throughout the years, so I picked her brain for details. She took me back to Great Plains Park sprayground. We visited it once 3 years ago! This girl has an amazing memory as far as I can tell. Well, her idea was a good one. We invited friends and made a day of it.